Last week I wrote about Claire Barrett of Hawthorne & Heaney, who does fine embroidery on livery, shirts and slippers for the bespoke menswear trade, as well as working with fashion designers in London. I came to her to learn about the process and with a suggestion for a project of my own. The idea was to embroiderer something on the outside of a suit, but as subtly as possible. No initials, no bright colours, but something that added a slightly different drop of beauty to a jacket. 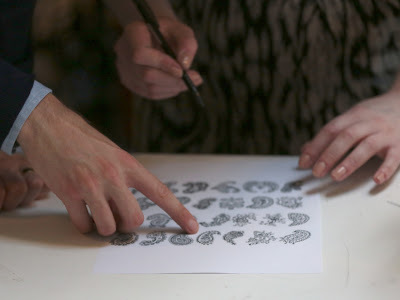 I’ve always identified with paisley – I think it goes back to a teenage obsession with Etro. 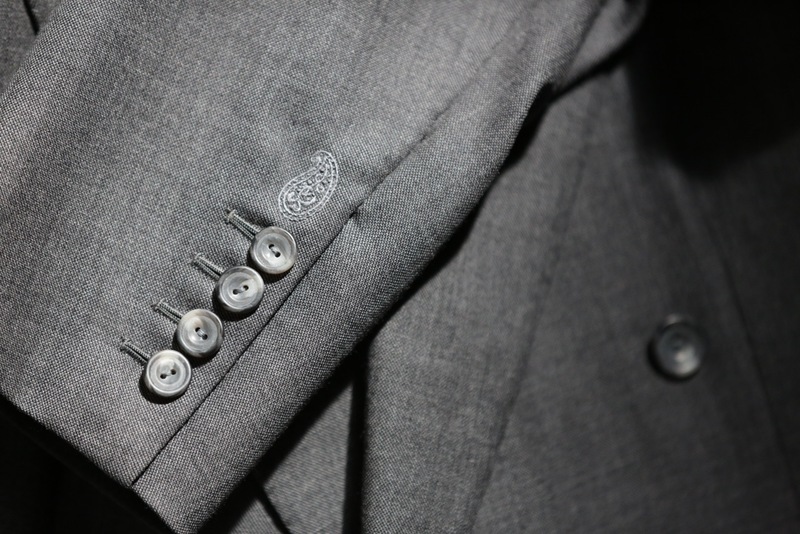 So I picked a small, simple paisley design to be embroidered on the jacket cuff, just behind the buttons. Both the colour of the thread and the size of the bulb of the paisley deliberately mimicked the buttons, running as a fifth, rather more decorative item in the row. 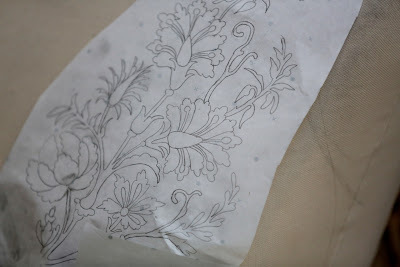 Embroidery involves a lot of drawing, as I mentioned last time in regards to Henry Poole livery. 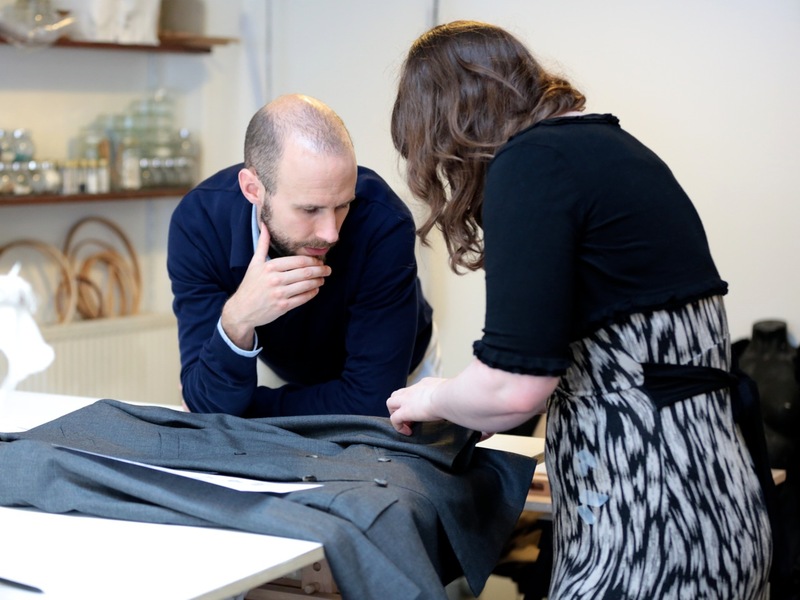 Below you can also see a design for a piece down a woman’s coat. With my little paisley, Claire first traced the design onto tracing paper and then pricked it with little holes around the lines. The paper is placed on the cloth and chalk powder sprinkled on the top, producing a chalk outline to sew onto. The chalk can also be suspended in paraffin to ensure it stays on the cloth and is not rubbed off. 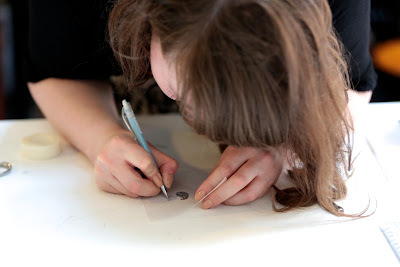 The tracing paper sketch also includes annotation showing which types of knot should be used where. With gold work many different knots are often used, but there are usually fewer with silk. Here there are just two: a stem stitch for the lines and French knots for the dots inside. In the event, the knots were doubled up to make them stand out more, as the grey silk was too similar to the cloth to be distinct. The work took around 45 minutes and the result was faultless. But I’m not entirely sure whether I will repeat it. I’ve always preferred the subtlest of style and this is rather more ostentatious, even given the small size and tone-on-tone shade. In the end it was an experiment, and I think it will take time for me to know whether I like it. Perhaps the same will be done inside next time. With thanks to Claire and team for the tea and hospitality. You can follow the discussion on Hawthorne and Heaney: embroidery project by entering your email address in the box below. You will then receive an email every time a new comment is added. These will also contain a link to a page where you can stop the alerts, and remove all of your related data from the site. Your idea may seem wierd to some folks, but I definitely love it. Besides contributing to preserve a craft, this small sign adds personnality to a jacket! Yet it should remain subtle, understated, exactly as in this case. I see it as a signature. I think the work, although beautiful, is going too far and i am somewhat suprised by you choosing or even experimenting with this, though i do sense your hesitation in your honest reply. I could be bolder in my comments but do not wish to enter it here nor offend! I rather like the idea, especially for a more casual suit. Not my cup of tea at all. However, the cuff holes look very good indeed; who made this coat for you? A very cool addition. While you’ve added it to the sleeve, I think I may try similar on a lapel. I do like it a great deal. I love that you seek out and champion artisanal craftsmen. And I can sympathize with the desire to find an application for fine embroidery. Scale and placement seem gratuitous. (Why bother?) More thought could be given to a ballsier design that better integrates with garment. What about black on black evening clothes? I think this is a good object lesson in the human animal’s unceasing need for novelty, and how a lot of good style in the formalized sense of clothing, design, or otherwise requires restraining the DNA when needed, producing something less true to impulse but more objectively complete. The intrepid author tries tailoring houses the world over, having suits, jackets, and appurtenances of every local style, shape, and flavor made, but soon this becomes his basic threshold and is no longer novel. He becomes bored with the familiarity of it all. 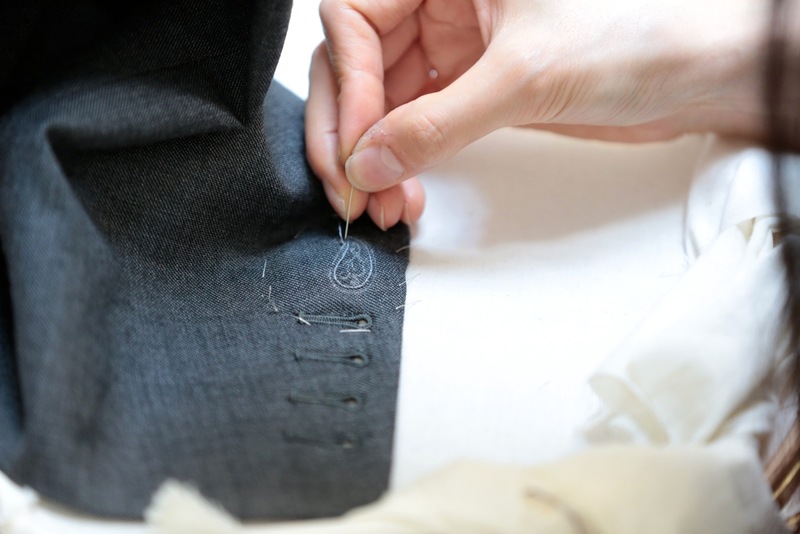 So he starts experimenting with the shape of a pocket, with embroidery, and other inscrutable details that for the regular reader — for whom trying new tailors in different countries would alone constitute novelty — seem eccentric. That embroidery might look fun on a dopp kit or a canvas bag. I think that traditional clothing works because it pursues anatomical ergonomics versus stylistic filigree: if the parts fit, interlock, and drape correctly, beauty emerges of its own accord. 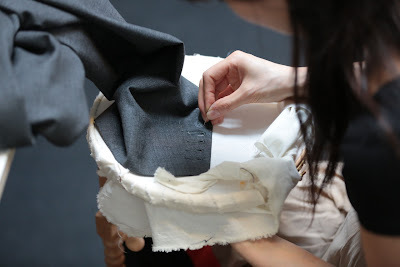 Men’s designer clothing of the baser kind differs in that it seeks beauty in the stylistic fillip: form is just a substrate for the embellishment, which is why those designs so often seem to “break” the ergonomics of tailored clothing. This experiment is reminiscent of Etro not just in the use of paisley, but in that an embroidered cuff is just the kind of revamp you can imagine them pitching at a design meeting. In the end, the author comes full circle, going to great lengths to insert a detail that the rest of us, toiling against lesser clothes, bend over backward to avoid in off the shelf clothes. I’ve been doing this for a while to my clothes, takes a rainy day to be able to sew it on but worth it. I appreciate and understand it. What I like is the fact that it is personal to the wearer (i.e. paisley – and as Simon says, picks up a teenage influence/obsession). Not only is there that link to the past, but there’s even a story to be told (to anyone who happens to ask) about the actual embroidering process itself and the embroiderer. An entire wardrobe decorated like this would be unnecessary but I can see the attraction of having something done like this for personal reasons. One other thought as to where else this could feature externally on a suit jacket – perhaps just above the breast pocket? Maybe in the same colour as the jacket cloth, but as a playful nod to the pocket squares which might appear in such pocket (and in any event, wearing a silk square, be it paisley or any other pattern, would cover the embroidery). Interesting idea! Did you consider rotating the pattern 90 degrees so the long axis of the shape would have been parallel to the buttonholes? That would have looked a bit more harmonious in my opinion. No no no no no! This upsets me almost as much as the double bottom hole trend I witnessed during the coverage of the Olympics. I get the same reaction when I see a beautiful women with a tatttoo on her lower back.